Since the late 19th century in Russia, tutus have been worn by ballerinas so that the audience can more fully appreciate the athleticism and artistry of the dancers. Those early tutus had 16 layers of fabric and went down to the knee! Tutu skirts are easy to make from modern tulle fabric, either by hand or by machine. There are many variations possible to make the tutu match a dance or costume theme. They can be made with a skirt underneath to wear to a party as well. Fold the tulle lengthwise so that the edges meet. The long, folded edge will act as the hem. Sew a long row of large gathering stitches by hand or with the sewing machine about 2 inches down from the edges of the tulle. Do not backstitch but do leave long tails of thread at either end. Pull the thread tails to gather the tulle until the fabric fits around the wearer's waist. Add 1 inch for a seam. Sew a piece of ribbon, bias tape or twill tape on top of the gathering stitches with small stitches to hold the gathered fabric in place. Leave about 12 inches of tape or ribbon on each side to tie a bow. Sew the short edges of the tulle together, forming a 1/2-inch seam along the back of the tutu, from 3 inches below the gathered fabric to the bottom edge. Backstitch each end of the seam to reinforce it. Close the tutu by tying together the ribbon or tape edges. The wearer can decide if it should be tucked in or tied in a pretty bow, and if the ribbon or tape should be trimmed shorter. 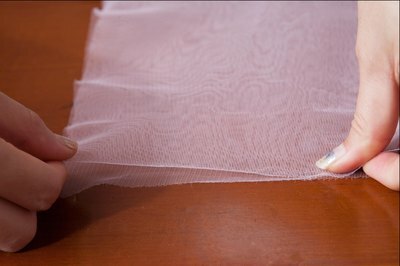 Tulle fabric does not need to be hemmed but the edges will show, so be careful to cut straight. Flower petals, sparkly confetti or other embellishments can be placed inside the fold of the tulle where it will be trapped but visible. For a fuller tutu, add more layers, possibly in additional complementary colors.